Great experience. Mitchell went through every detail and made the process fun and easy. He answered all our questions and made sure that we got exactly what we wanted. Thank you Mr. McCarty. We appreciate your business! mark was professional and courteous did great job of selling it. Mark, Richard and Darryl were all great. The process was neat and fast, 6 hours for installation. Clean up was thorough. The surround and the new tub are perfect. BathPlanet recently remodeled my master bathroom. They were quick to respond to my requests as well as ordering up the materials and installing the shower (including a difficult removal of a jetted tub). I will use them again for my next bathroom projects!! Thank you so much for taking the time to review us! Thank you for choosing us - we truly appreciate your business! Mark came to look at my bathroom project. Mark was very receptive as to MY NEEDS, and explained the process and what I should expect. I am very excited about their company and reputation, and I am so looking forward to starting the bathroom remodel. Looking forward to starting the project. We had a very good experience with Bath Planet! We live in Colorado Springs and talked to Mark who was very knowledgeable and friendly. He helpped us design our perfect tub to shower conversion offering many options. We were able to schedule the conversion to when we wanted it and the work was very well done even with a fiddley window kit. The guys did the job in record time without skimping on quality or courteousness. We love our new shower! Thanks Bath Planet! We highly recommend them to anyone who needs this kind of work done. I am very happy with Bath Planet. I 1st saw them at a home show and was impressed with they way they conducted them selves. Didn't attack you like the other vendors. The sales rep., Mark, came to our home to go over everything I'm detail not just the estimate. He was very professional, but a good old guy that was truthful and sincere. Very helpful on discussion and very knowledgeable on the products, company and construction industry. We have not had the work start yet, but will so a follow up review at that point. Thanks Bath Planet! After shopping around and getting multiple estimates including extensive work in trying to piecemeal our bathroom remodel project ourselves, Mitchell came to the rescue. We wanted to remodel our guest bathroom but didn’t want to spend on outrageous amount of money. However the more we shopped for quality, of course the higher the total cost became. When we contacted bath planet they sent Mitchell out and he had the complete package. He was very very knowledgeable, understanding of our needs, and really understands what goes into remodeling a bathroom. We consulted multiple general contractors, plumbers, and bathroom remodelers but after their visit to our home that job seemed to get bigger and much more expensive Without much resolution on any of the variables like what kind of sink, commode, tub, colors, texture, etc. Mitchell had the one stop shopping answer to all of our problems at a reasonable price. While we got other estimates of similar quality For similar products which we had to identify, not only did he present us with many choices for each element, but his pricing sealed the deal. Out of the seven other consultations and estimates we did, he had A wide range of choices for the fixtures flooring and walls, along with samples, a wide range in choices of material, patterns, and colors. Most importantly, he guided us and gave us valuable advice on the entire process and products. The whole process from start till signing the deal only took about an hour and a half. We are very very happy with the price. More to follow after the job is done. 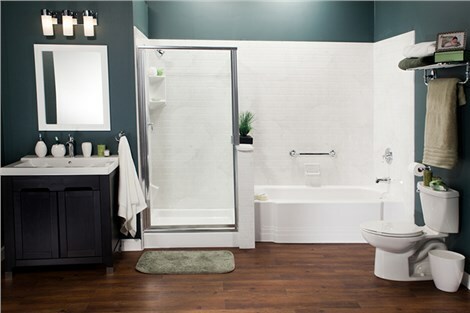 If you were thinking about a bathroom remodeling project, do your research add show rooms, Lowes, and Home Depot. When Mitchell comes and makes comparisons between what you would look that and what he offers you will see value in his services. It has been almost 3 weeks since we had our tub replaced with a shower by Bath Planet. We were told it would take 6 to 8 weeks to get the work done and would take a day to complete. It was 6 weeks when we got the call that it would be done. The workers were very courteous and friendly and were done in less than 6 hours. Everything was done as promised and we are extremely pleased with the results. Thank you for allowing us to do your bathroom! We are so happy you are pleased with the results! Thank you for taking the time to leave us a review. We truly appreciate your business.